Popcorn Chicken – One of our most popular High Five Recipes! Why DID the chicken cross the road? And how did he manage not to get hit en route? And if he just wanted to get to the other side, WHAT exactly was on the other side that he was so excited to get to? And why wasn’t he just at home where he was supposed to be? Where was his owner? Yes, I will be happy to continue to give you these little morsels of deep thoughts to ponder while you do your dishes. This recipe really is as simple as it sounds. Make the chicken pieces as big or small as you like. Want more High Five Recipes like this one? 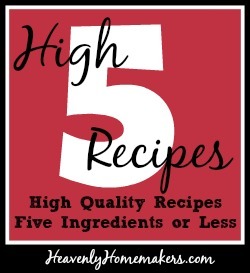 You’ll find all of our real food, 5 ingredient recipes here! You might be interested to know that when Matt and I visited west Africa in ’95, there were all kinds of animals crossing roads at all times of the day…and some of them were chickens. Indeed, it did look as if all they wanted to do was get to the other side. How ’bout that? Seriously? I love popcorn chicken. I never knew you could make it at home so easily . . . I will have to show Chris. Thanks! We can’t use butter due to my son’s life-threatening allergy… do you think coconut oil would work? Thanks! I look forward to trying this out! Yum. Thanks for this recipe! I was wondering about it when I saw it on your menu. I bet it would be good with some of that organic ranch dip I ordered! I’ll try this one out. My recipe calls for soaking the cut up chicken breasts in coconut milk (for at least 15 minutes or longer) then fry it.. but frying does take time. I would love to cut out that step. Our chickens cross the road in search of tasty bugs and whatnot. I got a little concerned when I saw one dragging a leg – I worry that one of them isn’t going to get out of the way in time. Hubs assured me that she hadn’t been hit, he thinks she got stepped on when she was a little peeper. I’m not sure if that’s better or worse. So easy!! I’m thinking of making this for a fun dinner, too!! Seriously, it’s this easy?! I was going to make fried chicken tonight for Martha’s birthday… I may have to surprise everyone with this instead!! 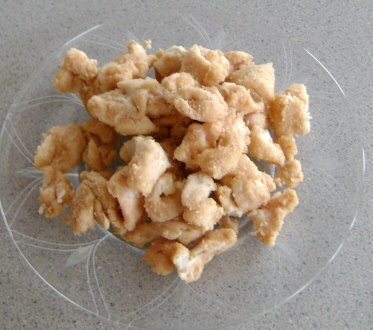 Why is this called popcorn chicken? I have three chicken breasts and was wondering what I was going to make for dinner tomorrow night! Looks like it will be popcorn chicken! Yummy! I bet my kids would love this! Thanks for the recipe! Looks quick and easy — and tasty! This look so yummy! I’m going to put it on my menu for next week. This is a really cheap alternative for my family opposed to already buying the breaded popcorn chicken. Thank you so much for this recipe. I can guarantee my sons are going to thank you. P.S. Visit Mornings With Mom, a new online magazine for Christian women. I made this for dinner tonight. The kids loved it and they don’t usually care for popcorn chicken. Thanks for the recipe. Neat-o! I was wondering how wheat flour would work. Looks great! I’m amazed at how simple, quick, and easy you make things look! This has got to be better than the large chain stores version, which my six year old can’t seem to live without! And I just happen to have gotten a great deal on chicken breasts. I made popcorn chicken tonight. It was yummy… and oh so easy. Thank you for sharing the recipe. My boys thought we could make it a bit spicier next time (more like Chik-Fil-A, they say). I thought I might add some Emeril’s Baby Bam in place of the garlic powder next time. Thanks for this recipe! I’ve made it several times and I like to spice it up more. To make these more Buffalo wing spicy I melted the butter with hot sauce and garlic powder then poured that over the chicken on the pan…so good and easy. These were really yummy. My whole family loved these, including my DS who happily went for seconds. I served the chicken with honey mustard dipping sauce (1T dijon: 1 1/2 tsp. honey), potato wedges and coleslaw. So good. thank you so much for all your great recipes! i’m “slowly” introducing whole grains, whole foods into our lives, and its recipes like this that are really helping alot! We had this for lunch today and it was really yummy!!!! Sounds delicious and easy. I will be adding this to my menu next week. On a splurge I bought some OCharley’s honey mustard and I’ve been trying to come up with recipes to use it! Sounds like a good dinner tonight! Oh! I can’t wait to get home! Just made these for lunch…but I think I didn’t get the pieces cut small enough…they didn’t have the crunchies that the ones in your pic seem to have. But they were still tasty! YUM! I will be on the lookout for a major sale on boneless chicken. I’d like to make one mess and several batches. It’s a yummy, healthy, easy meal. I would love to have it on hand. The chicken should cross the road to my apartment. Have you ever froze any or had to reheat any? I’m just cooking for two – so trying to figure out if I should use the same amount of meat and if it will save well for left overs, or if it would be better to make a smaller batch..Thanks! I’m excited to try it! Yes, these absolutely freeze and reheat well! You can freeze them before you bake, and just bake as many as you need…or you can bake them all, freeze the leftovers and just reheat in the oven for a few minutes. This was our lunch today…along with broccoli and strawberries. Yum! I think I need to increase the oven temperature next time but the recipe is definitely a keeper. Thanks! What a wonderful recipe! I just tried it tonight and it was thoroughly enjoyed by all. Thank you!! I just saw this linked on Menu Planning Monday~ I think we’ll give it a go on Friday~ Looks yummy! I made up a couple of batches of the popcorn chicken and placed them in the freezer. Just wondering if you have done this and how does it effect the cooking time? I think if you just add 2-3 minutes to the cooking time they should turn out about right! Hi! I just found these and made them today. They were tasty, however, they were not crispy at all. Am I missing something? I coated the chicken in the dry flour mixture, but since there is no egg, I’m wondering how you got yours to be thick (at least it looks thick in the picture) and crispy. Thanks! I wouldn’t say mine are very crispy either. They probably just look a little crispy in the picture!! :) I think to get them nice and crispy you’d have to coate them with egg, like you mentioned and the flour mixture, then fry them. Thanks for the recipe! We enjoyed this last night! My husband and 4children loved this. I didn’t have any leftovers that night. I family loved this recipe, the only thing I did different is with some of the chicken I put it in hot sauce before dipping it into the flour. It reminded us of boneless hot wings. Thanks for all the great recipes. I made this recipe tonight and my family ate every single nugget!! This includes my husband who is NOT a big fan of chicken (unless it’s fried). I made 1 1/2 lbs of chicken for our family of four (my husband, our two little boys that eat more then my husband and I combined and myself). I had nothing left! I knew they wouldn’t be crispy so I sprayed them with a tiny bit of non-stick spray at the end and turned on my broiler for just a minute or two. That added a tiny crisp. I also added a tiny bit of cajun seasoning for a little spice. Thank you so much for some great, easy recipes! They aren’t really supposed to be crispy, but neither are they supposed to be soggy. I usually bake mine on a baking stone…I wonder if that was the difference? Too much butter! I used the same amount of butter but I only had two breasts. They were soggy but still good! Do you buy chicken breasts from the grocery store, or do you buy a whole free range organic chicken and use the meat from that? I buy Smart Chicken from the grocery store when I find it on sale. It’s still a compromise, but better than Tyson. I also get it sometimes from Whole Foods when we go there (like, twice a year!). I’m going to make these for dinner tonight and if they are a family hit make sure to put some in the freezer for quick meal ideas. I think I’ll add some garlic gold to them since it’s a hit in our house too. Thank you for sharing! I love simple! Made these for my kids tonight who are very picky. They absolutely loved them. Thanks so much for posting all your recipe ideas! I have enjoyed learning to cook healthier for my family. I made this tonight and it was really yummy! I substituted almond flour for the wheat flour to make it gluten free. I think I’m going to follow the suggestion of another comment and use Emeril’s baby bam seasoning next time. And I think I’ll broil the chicken for the last 5 minutes to make it crispier. Thanks for the great and easy recipe that’s also freezer friendly! Just want to say, I love your blog! I just made this and my kids are devouring it!! I added some parmesan cheese with the flour and put them under the broiler for the last few minutes. I’ve only managed to get one taste but they are good! 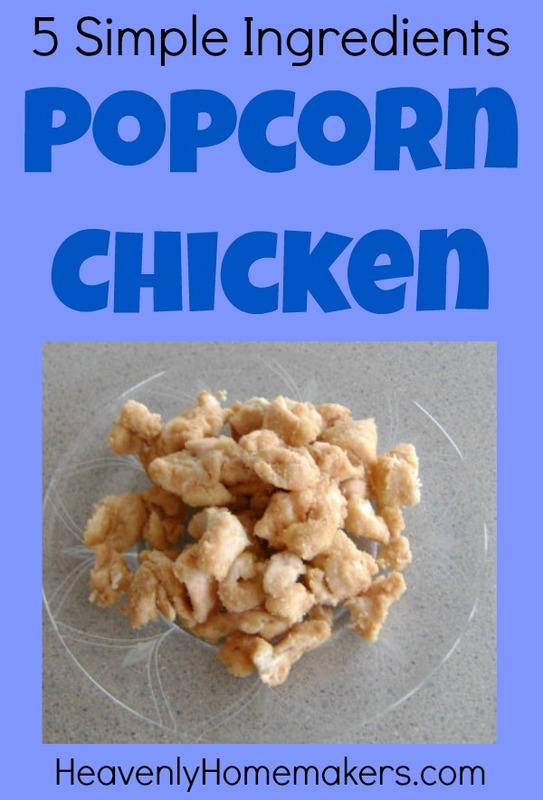 One of my hubby’s favorite foods is popcorn chicken. I remembered seeing this on your site, and told him I was making it for dinner. His response? “You can do that?” Yeah, I think I can handle it! I used chicken thighs instead of breasts (there was an incredible deal on smart chicken thighs and legs at the store!) and they worked great. Took 12 thighs to feed my hungry crew though! Made this for dinner tonight – it was delicious! Thanks!! My family is not big on potatoes, and I’m having trouble coming up with another side dish. What do you usually serve with these? I would check out this page http://heavenlyhomemakers.com/side-dishes-and-snacks to see if anything stands out to you! Hey! While the popcorn chicken looks great, what caught my eye is that you went to West Africa in ’95. I grew up there in Sierra Leone as a missionary kid and just wondered where in West Africa you visted. I left in ’94 to come back to the States for good. And, yes, the wild animals are everywhere there! Can you freeze these once they are baked? Oh these sound so good! Looking through for an idea for dinner. Wanted a grill out, but we’re getting a proper downpour, complete with rumbling thunder so it looks like the grill and patio are a no-go. But I love love love home made versions of the KFC popcorn chicken bowl, which suddenly sounds perfect. I’ve always made it with grilled chicken, but popcorn chicken is all that’s needed to make it perfect! This has become a staple at our house. I have a daughter who, until about a year ago, was unable to eat more than 20 grams of protein per day due to a metabolic disorder. Last year she had a liver transplant, which fixed the immediate problem, but she’s so used to meat making her sick that it’s hard to choke it down. She’ll eat hot dogs, pepperoni, and some other highly processed meats, but this is the first whole food meat dish that she would actually eat. Willingly. Thank you! Oh–I bought some almond flour shortly before she was hospitalized, and forgot why in the three months before we came home. It needs to be used, so I substituted it for the wheat flour in this recipe. We really like it! It somehow enhances the cheese flavor, so it almost tastes like the chicken is coated entirely with Parmesan. I dream…of a world…wherein a chicken can cross the road…without having its motives questioned. Would coconut oil be able to be substituted for the butter? I have 1 daughter that cannot have dairy. Using coconut oil should work great! Just curious…what country in West Africa did you visit? My family and I are missionaries in Senegal. Were you on a short-term missions trip? Ghana and Togo for just a few months one summer. God bless your ministry! Thanks Laura, for all your tips, tricks, simple ingredients, budget friendly, and EASY family friendly recipes. I have two toddlers, and a chef husband, who is used to using fancy ingredients and having complicated recipes, of which I am not qualified or have the time to replicate. We have found that all the recipes we have tried from your site hit the spot! How could you do this to me!?! I ate 3 helpings of this! My daughters and I devoured the whole pan . :) it was super yummy. Thank you for making such wonderful and easy recipes.